Rooms in the classic standard. 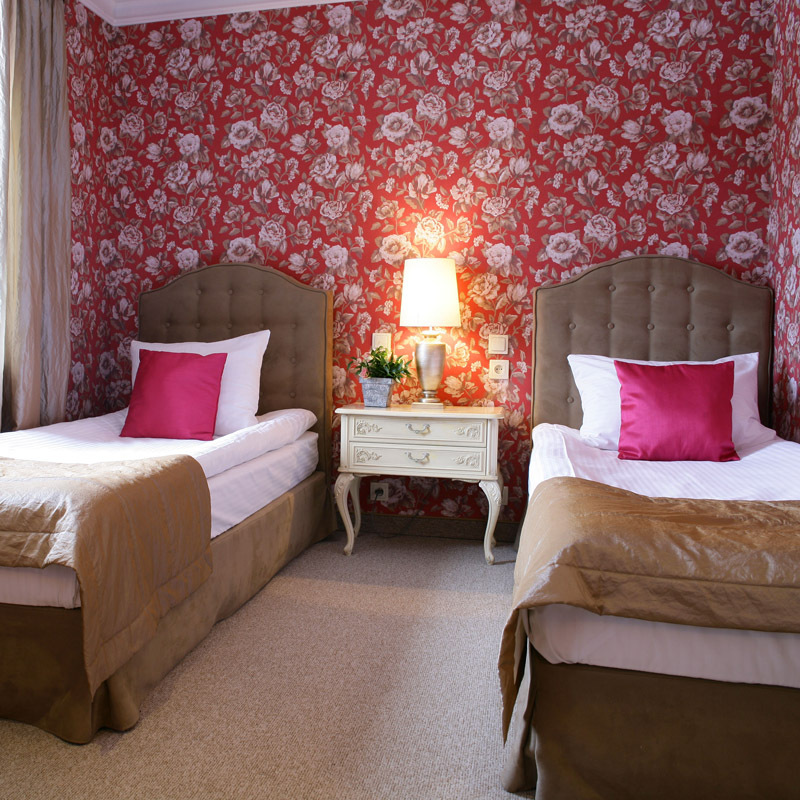 You can choose a room with a double bed or separate beds. Each has a bathroom with a shower. Standard rooms are located on the ground floor and the first and second floor of the building. Rooms are equipped with towels, hotel cosmetics, hair dryer, telephone, LCD TV, internet access. The spacious rooms with higher standard. Single room are decorated in gold or dovish. The double rooms used color blue-black, raspberry and chocolate shades. 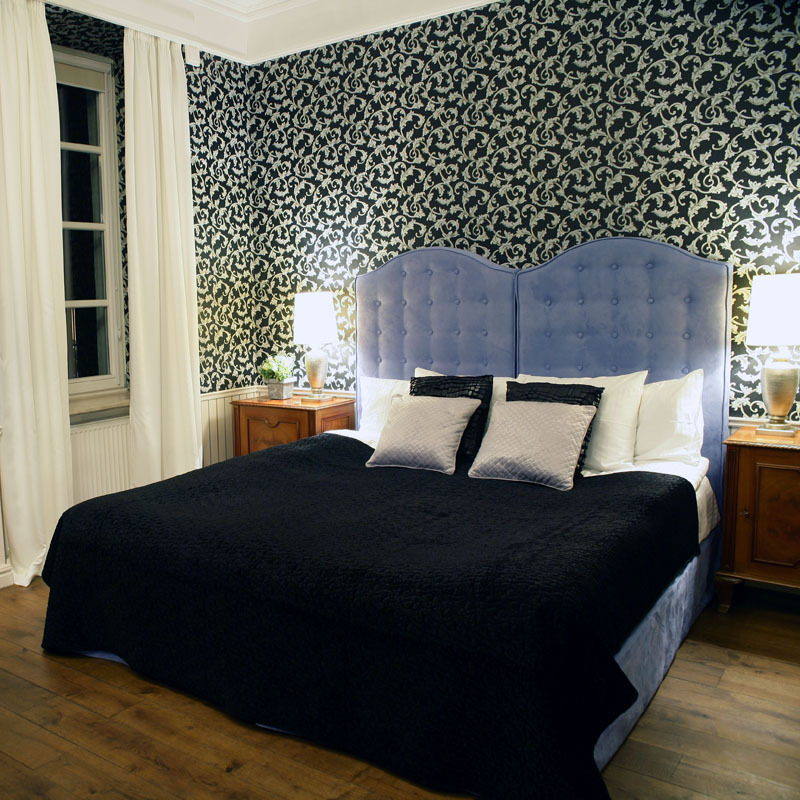 Superior rooms are located on the ground floor and first floor of the mansion. Each has a private bathroom with shower. Our guests in superior rooms only receive bathrobes and tea and coffee making facilities. The apartment is located in the heart of the manor and has original wooden beams and high vaulted ceilings which make it bright and spacious. Centrally placed is comfortable, large bed decorated with a canopy. Decorated with period furniture, like the living room with a beautiful classical bath on the golden legs. The apartment opens onto a terrace that allows you to watch the sunset. The apartment is equipped with towels, hotel cosmetics, hair dryer, telephone, LCD TV, internet access. Our guests only in the Apartment receive bathrobes and tea and coffee making facilities. White Home is an independent apartment in the cottage. It consists of: bedroom, living room with fireplace, fully equipped kitchen, dining room, hallway and bathroom. The name of the apartment comes from the dominant white color of equipment. White Home is ideal for people who appreciate the comfort and independence while they can still enjoy all the attractions of Kaliszki Manor. White home can host maximum 5 people. White Home is equipped with towels, hotel cosmetics, hair dryer, LCD TV, internet access. Our guests in the White Home have a kitchen equipped with a refrigerator,hob, coffee maker, kettle and crockery. Studio rooms are two double rooms connected by a common corridor, where there is a bathroom with shower. Studio rooms are located on the second floor of the building and each of them offers accommodation for 4 people. These rooms are particularly suitable for families with children. Studio rooms are equipped with towels, hotel cosmetics, hair dryer, telephone, LCD TV, internet access. Room price includes accommodation with breakfast (except White Home). Children under 3 years are free of charge.. For an additional fee we can provide travel cot in a room with bedding for children up to 3 years or an extra bed for an older child 3-15 years. Check-in is from 14:00 to 12:00 on the next day. The given prices are gross prices and include VAT. We accept credit cards.